The title Fiddler on the Roof stems from a painting by Marc Chagall, one of many surreal paintings he created of Eastern European Jewish life. It is one of the great musicals, its Jewish whimsy creates an endearing atmosphere that belies the many serious messages contained within the story with its bitter ending. Most of us, at some stage, have tried to play our fiddles on the roof knowing how allusive joy can be and how difficult it can be to maintain. Here, moonlighting from his ‘day job’ as Artistic director of The Wales Theatre Company where he has been very much his own fiddler on the roof since he started the company in 2003 Michael Bogdanov is bowing on top of his form. He is an experienced and Internationally acclaimed director that has a mastery of all the skills that go into the making of good theatre. One of principle skills is to impart the joy of performance to his cast. The cast here, led by the commanding presence of Peter Karrie, is clearly having a great time and infects us all with their vigour and delight. 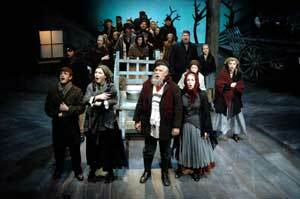 Despite the changing times the fiddler sits firmly on the roof for much of the early part of story. Karrie engages with us and his maker right from the start as he exchanges confidences and requests with both of us with a twinkle in his eye and with a deep warmth within that well known singing voice. Standing before us he explains: “A fiddler on the roof. Sounds crazy, no? But here, in our little village of Anatevka, you might say everyone of us is a fiddler on the roof trying to scratch out a pleasant, simple tune without breaking his neck. It isn't easy. You may ask 'Why do we stay up there if it's so dangerous?' Well, we stay because Anatevka is our home. And how do we keep our balance? That I can tell you in one word: Tradition” and the cast burst into the first of many hearty song and dance numbers that light up the show. The story ends with everyone having to leave their much loved village and an uncertain future for Russian Jews at the turn of the twentieth century. But for the moment tradition prevails. The matchmaking tradition plays an important part in the story, particularly as Tevye has five beautiful daughters who are all enchantingly played by Cathryn Davis, Linos Daniel, and Catherine Olding with several young local actresses alternating the younger two. Both Debden Clarke as the matchmaker and Andrea Miller as Goldie, who is the perfect match to Karrie’s Teyve are the epitome of female Jewish overly motherlyness. It’s no wonder Teyve wishes he was a rich man. the song gives Karrie the opportunity to fill the auditorium with his great voice and good humour, later as he ask his wife Do You Love Me? we are seduced by the contrasting gentleness of his exemplary singing.